Much of that commotion stemmed from concern about the theological implications of Darwin’s ideas. The English naturalist had carefully avoided discussion of life’s origin and had credited God with responsibility for having “impressed on matter” the laws of nature. But the fact remained that he attributed the numerous species that had appeared during the course of the earth’s history to a capricious, wasteful, sometimes even cruel process that seemed to require neither divine intervention nor even a divine plan. And, although Darwin did not explicitly include humans in his theory until 1871, theological commentators recognized much earlier that the logic of his argument extended there. It was also immediately apparent that Darwin’s theory challenged not only the “plain sense” meaning of the scriptural creation narrative, but also many theological doctrines central to most Christians’ understanding of faith. 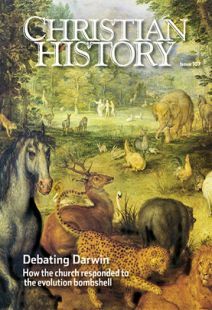 It was not until most natural historians endorsed the theory of evolution in the 1870s that American Protestants changed focus from objecting to it on scientific grounds to considering its theological implications. Many liberal Protestants in mainline denominations, convinced that scientists were the most able expositors of God’s activities in nature, agreed that if natural historians were on board with the theory, Christian believers needed to “reconstruct” theology to bring it into accord. First, liberals recognized that they needed to come to grips with whether one could still believe in God in the face of evolution. Some held, as Unitarian James Bixby wrote, that an evolutionary process characterized by ever “higher variations and more perfect organization” should be ascribed to the work of the divine Mind rather than to the contingencies of trial and error. Others took a page from the book of Harvard botanist Asa Gray, saying that the most plausible explanation for the survival of the fittest was divine design. Still others argued that the very fact that the cosmos was intelligible served as compelling enough evidence for the existence of a rational and benevolent deity. But, at the same time, they recognized that some biblical doctrines were so central to the Christian worldview that they simply could not be abandoned. Of particular importance was the claim that human beings had been created in God’s image. Liberals argued that the process by which the human species arrived on the planet was irrelevant to the question of the nature of that species. It was therefore quite acceptable to regard humans as different in kind from all other species, because their endowments of mind and spirit distinguished them as bearers of God’s image. These responses have informed the views of liberal Protestants ever since. Reacting to Darwin’s theory was not the only reason these Christians engaged in theological reformulation. At the same time, they were also grappling with new developments in biblical criticism that seemed to downplay the accuracy of the biblical text, new theories of how history operated, and new challenges associated with greater interactions with other world religions. Jon H. Roberts is the Tomorrow Foundation Professor of American Intellectual History at Boston University and the author of Darwinism and the Divine in America: Protestant Intellectuals and Organic Evolution, 1859–1900.